A book for everyone who does business with China or in China. The history-making development of the Chinese economy has entered a new phase. China is moving aggressively from a strategy of imitation to one of innovation. Driven both by domestic needs and by global ambition, China is establishing itself at the forefront of technological innovation. Western businesses need to prepare for a tidal wave of innovation from China that is about to hit Western markets, and Chinese businesses need to understand the critical importance of innovation in their future. Experts George Yip and Bruce McKern explain this epic transformation and propose strategies for both Western and Chinese companies. This book is for everyone who does business with China or in China, or is interested in the development of the world's fastest-growing economy. Western CEOs can learn from Chinese companies and can create an effective innovation process in China, for China and the world. Chinese CEOs can benefit from understanding the strategies of their peers as they strive to enter foreign markets. And all Western businesses should prepare for disruption from their new competitors. Yip and McKern provide case studies of successful firms, outline ten ways in which the managerial and innovative capabilities of these firms differ from those of Western firms, and describe how multinationals doing business in China can become part of the Chinese ecosystem of new knowledge and technology. Yip and McKern argue that these innovation capabilities will be the basis for creating world-class products and services to meet the challenges of a new era of global competition. 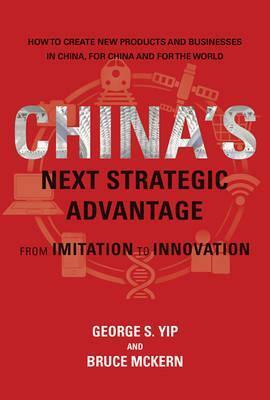 George S. Yip is Professor of Marketing and Strategy at Imperial College Business School in London. He was previously Professor of Strategy and Codirector of the Centre on China Innovation at China Europe International Business School in Shanghai. Bruce McKern is former director of Stanford University's Sloan Master's Program, Visiting Professor at CEIBS, and Visiting Research Fellow at Oxford University and INSEAD.